A Seat with a View – but does it Recline? When the Serco press release announcing the arrival of the new sleeper trains was launched on 16, Julian noticed the absence of any reference to the 'Flat Beds' option which was specified in the franchise agreement as one of the types of accommodation that Caledonian sleeper were required to provide on the new trains. "The Franchise Agreement did not let you change the present arrangement until the introduction of the new rolling stock, when a Flatbed could be seen as a compensation for the removal of the shared option." and asking for an assurance that Flatbeds were still part of the proposed accommodation mix. Such an assurance was never received, and it soon became obvious that there would be no Flatbeds on the new trains. Not only that, but it appeared from the images of the 'Comfort Seats' included in the Serco press release that these seats would not recline or have any leg support, again in contravention of the terms of the franchise agreement. Pressed on this point, Serco insisted that the seats on the new trains would recline, admitted that the picture in the press release was a computer-generated image which bore no relation to reality, and claimed that they could not release drawings or detailed images of the actual seats, because these were ".. the seat manufacturer’s commercially confidential documents.. ". By this time, (23 January), Caledonian Sleeper had quietly revealed that they proposed to remove the right for Railcard holders to get their expected 33% discount in shared cabins, but retain the discount for seated accommodation and solo cabins. This prompted Julian to undertake further research into the promise and the reality of seated accommodation on the sleeper, and he wrote the following article. Four years ago Serco was awarded the franchise for the Caledonian Sleeper based on ambitious plans to provide “an iconic Scottish railway journey available for all from back-packers to business travellers” and detailed their plans in a glossy brochure. The brochure focussed on the new rolling stock they were planning to introduce. Before. Glossy brochure May 2014. 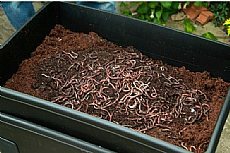 Note there are two forms of accommodation. 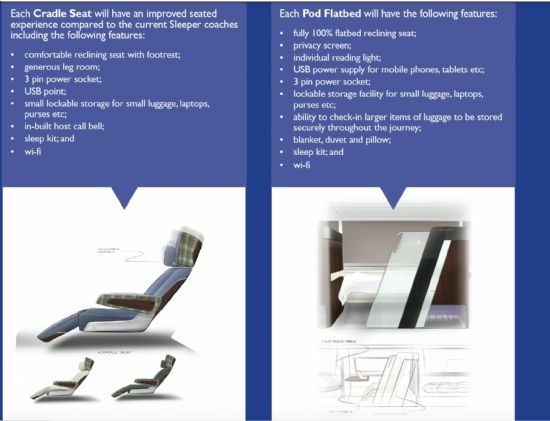 The cradle seat with a reclining seat and footrest and a Pod Flatbed which is a fully 100% reclining seat. Any change from the Franchise Agreement has to be agreed by Scottish Minsters. Why in this £100 million investment in new trains has it proved impossible to provide what was promised and why have Scottish Ministers agreed to it? The decision to provide en-suite accommodation and double-bedded suites (starting at £200 per person) makes the whole Caledonian Sleeper refurbishment look like a vanity project of Scottish Minsters which Serco are delivering for the benefit of wealthy tourists and overpaid business men to the detriment of the less affluent." So we are still waiting to see images or drawings of the actual (reclining?) 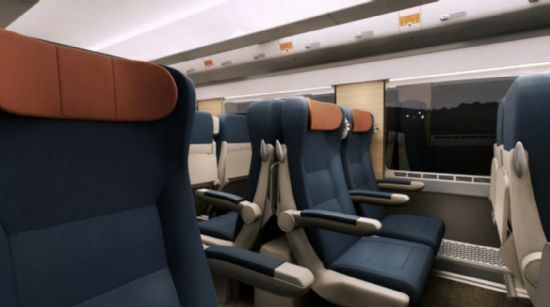 seats to be installed in the new trains, having so far only an assurance from Caledonian Sleeper that they "do intend to release photos and renders of the seats once the final testing has been completed." We also require a response from Serco and Transport Scotland (on behalf of the Scottish Government), to the question of why Serco Caledonian Sleeper were allowed to renege on the undertaking in the franchise agreement to provide basic 'horizontal' accommodation in the form of the 'Pod Flatbeds' originally specified. Had these been provided, the proposed withdrawal of the option for single passengers to share sleeper compartments, though still unwelcome, would have been less of a disincentive to using the sleeper, and less detrimental financially, to younger and less well-off single travellers.